Has anyone with a fear of public speaking ever gotten better by hearing: "Don't worry, everyone gets nervous about giving speeches", or tips like: "Just imagine the audience is sitting there in their underwear"? 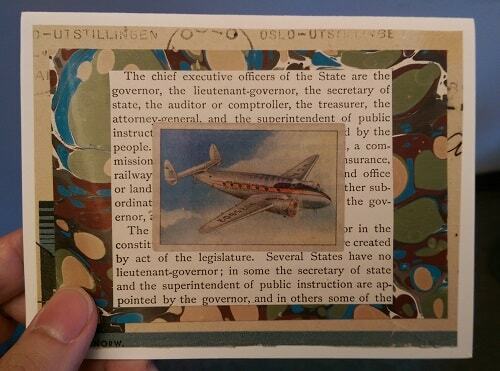 And people with fear of flying already know: "Airplanes are the safest form of travel. You have a higher chance of getting killed on the drive to the airport." --- What a comforting idea! If willpower, motivation and good advice were enough to make positive changes happen, all those self-help books and motivational quotes should've worked by now. With hypnosis, we can go far beyond that kind of well-meaning advice and reassurance. "Dear Steve, My trip to __________ was one of my best vacations ever... You have reinforced my belief in the hypnotic process. I am sure that I could get on another plane tomorrow without hesitation. Thanks so much for your expertise." 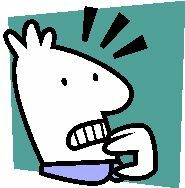 Hypnosis is particularly effective in helping people stop unconscious stress-related habits, nail biting for example. People who have suffered the effects of chewing their nails, the bleeding and soreness, and the embarrassment involved, do not need more advice, motivation, or the pressure of being told "Just stop it!" That doesn't work. "He Was So Calm at His Bar Exam, He Read the Sports Section of the Paper During Lunch Break!" 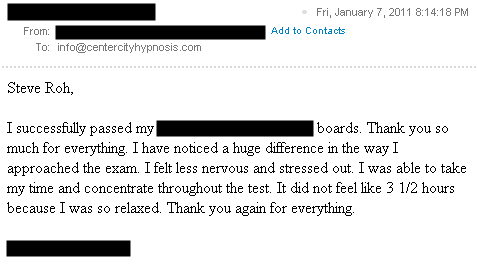 Test anxiety is another one of the most common things I've helped people with. It's very satisfying because so many people run into obstacles after a lot of dedicated studying and effort, only to run into problems when they're trying to pass a certification or board exam in order to earn a professional credential. "Before I came to the first initial visit with Steve, I had sat for the bar exam previously which is, as a lot of people know who have to take it, extremely anxiety producing... After the first appointment with Steve, I had actually taken the bar exam the following morning... and the more the process went on through the day, the more comfortable and relaxed I felt. At the break time for lunch during the first day, I would see all the fellow candidates around me who were frantically on the floor studying and trying to cram within that hour whatever pieces of law they could. People just looked so despondent walking around and just had their heads in their hands... I comfortably just had my lunch. That morning I brought the sports section of the paper and opened up the sports section and actually read that comfortably and understood what I was reading with calmness and confidence. I just felt relaxed and folded it up and went back before the exam began. I guess I didn't realize it at the time but two people had actually passed me coming down the hallway and pointed out to me saying, "Wow, you really look relaxed today," in a joking way. I guess it wasn't until I thought about it and explained the feelings and the situation later that I guess, you know what? If I were walking down the hall and saw somebody sitting on the side reading a newspaper, I guess I would be pretty envious of that guy..."
When someone carries that relaxed attitude of being calm and confident even in high pressure situations, people take notice, just like the story describes. After one appointment with you, where she doesn't remember actually discussing the spider phobia, she actually can go up to a spider, up to a spider web, and then examine the details on its legs. She doesn't like spiders, and she thinks they're kind of gross, but if she sees a spider, she's like, take a look at this spider. But it's absolutely amazing because her phobia was obviously non-rational but... it was a very deep fear. Pretty miraculous recovery from that. And we live in a house where we have a lot of house spiders and our garage has a lot of spiders in it, and she walks under a web every single day going down to our car, and she just looks at the spider, oh that's interesting, straight blanks. But before, she wouldn't even be able to go near the garage if that spider was there. Thank you!" "For 20 years, I was a cheek-chewer... After two appointments, I am free of this affliction. I will say, it didn't happen overnight, but when I was tempted, I would think of his words... and eventually, my mouth healed and the urge subsided. 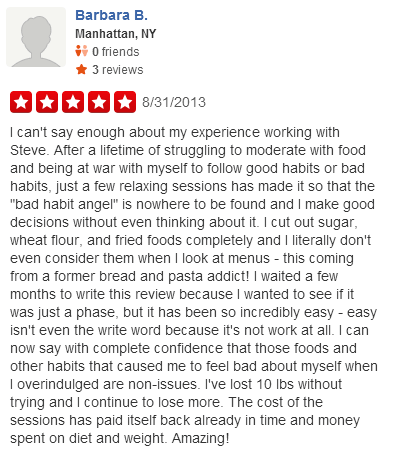 I highly recommend Steve if you are looking to break a bad habit, or just want to feel better in general." "It was amazing how I got hypnotized so easily and it truly worked almost immediately in my every day thinking...My reasons for [seeking help] was to work on my self confidence issues and boy did it work. The hypnosis has allowed me to be a more positive person in many areas of my everyday life. I think this is so worth it for any sort of situation in life." "A refreshing alternative to traditional 'therapy'. Steve really strives to help you help yourself... Thanks, you helped me deal with that emotional baggage I've been carrying around." This client was invited to go on a TV program to promote her business, but had been so anxious and nervous about appearances in the past, that she was seriously considering turning down future invitations. She knew that would be a terrible missed opportunity, so she came in and we did hypnosis to help her with that nervousness. After her TV appearance, she wanted me to provide honest feedback about how she did. Since I am kind of an obnoxious jerk, I have no problem providing brutal but hopefully constructive feedback. "I felt more confident than I have ever in the past. Wasn't really even panicking. Thank you!" Now she can focus on growing and promoting her business, instead of worrying about and avoiding public speaking. CAUTION: Do Not Use Hypnotism as a "Short Cut"! Hypnosis should not be used as another avoidance tactic. If you have problems in life, don't want to deal with them, and just hope that you can "go under" and hear something like "you will be happy, confident, motivated, etc. etc. ", that is a lousy plan. The people who do best with this are the people who have been working on themselves, and who find that hypnosis can be a powerful "force-multiplier" for the effort they've already put into the work. But if you multiply ZERO with any other number, what do you get? As noted earlier, if you're suffering from a possible psychological disorder or severe emotional disturbance, then I urge you to check out the state-licensed mental health resources on the GPSCH site listed elsewhere on this site. Although hypnosis can help with a wide variety of issues involving unwanted behaviors, stress or emotional factors, this doesn't mean that hypnosis can "cure" or "treat" disorders, or that it should be used in all individual cases. It should not be used as a substitute for comprehensive medical or mental health treatment. "Hypnosis cannot, and should not, stand alone as the sole medical or psychological intervention for any disorder. Hypnosis should not be used instead of appropriate medical, dental, or psychological treatment, and any individual with a medical or psychological problem should first consult a qualified health care provider for diagnosis and professional advice." I know that some people are reluctant to seek help from "traditional" sources, because of a belief that they will simply prescribe a pill and medicate you... but I think the resources on that list, who have both hypnotic training and formal clinical background, are likely to have a broader view of how to help people. Besides, there's nothing wrong with medication if it helps (although there is some research that indicates the use of medication to deal with specific phobias like fear of flying can backfire and make the fear more persistent). Hypnosis can be a powerful and effective way to improve subconscious, automatic patterns, but it should not be considered as a substitute for dealing with mental or emotional disorders. It should also not be used to avoid dealing with difficult life situations, although it can be of great use in supporting you as you get through them. Many people talk about wanting more self-esteem. This is often expressed as "I want to feel good enough / smart enough." But self-esteem is an END-RESULT of behavior that is in line with your personal values. Many people endlessly chase self-esteem without ever identifying what behaviors and values would cause them to increase their sense of ESTEEM (estimated value) of themselves. Also, the type of thinking that thinks in terms like "good enough / smart enough" is fundamentally flawed. Those concepts are usually a remnant of child-like desire for approval. Reinforcing that desire as an adult, by hoping to hear "You ARE good enough" or "You ARE smart enough" just keeps people in that under-developed state. In fact there is evidence, both research-based and from simple everyday observation, that when children are praised with statements like "You are smart!" (innate characteristic), this type of praise can harm motivation, confidence, and achievement, compared to praising children for effort (behavior). 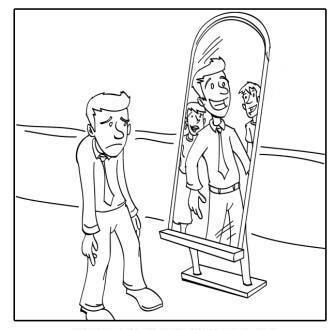 Similar effects have been found in adults who engage in commonly recommended practices like looking in the mirror and telling themselves how lovable they are; research shows that this often causes people to feel worse about themselves, NOT better... so if you've tried that kind of thing before and it hasn't helped you, don't feel too bad about it! I mention this in order to set expectations correctly, because so many people have been sold, and so many people are eager to sell you, on the idea that some program or book or audio recording will result in self-esteem. Sometimes people think that if they go "deeply" into hypnosis and hear a suggestion like "You will have self-esteem", that is supposed to do something. But those are just words, and superficial suggestions will have superficial effects no matter how "deep" the hypnosis may be. The truly deep work is when we use hypnosis to break the habit of thinking in "good enough / smart enough" terms, when we eliminate the belief that those concepts are important in the first place. That way you can get on with your life and live fully according to your values, which is a lot more useful than thinking about how smart and good you think you might be. Take a look at the rest of the site for more videos, audio clips and emails from clients describing their experiences, as well as information about how to setup your FREE personal consultation. Would you like to go through a whole day and not have to think about your next chance to smoke? Would it feel great knowing that you're in control, not the cigarettes? Do you feel yourself slowing down and getting more tired and worn-out as you continue smoking? If I could show you how you can quit smoking, no matter how long you've smoked, without pills or patches, would you be interested in knowing more? According to the largest scientific study to compare the effectiveness of various smoking cessation methods, hypnosis has the highest success rate of any approach, with one exception. This study, published by the University of Iowa, analyzed the results of over 600 previous scientific studies involving more than 70,000 people. But don't take my word for it: the link to this study is here (Adobe PDF document). The one exception? Cases where someone experienced serious cardiac events or pulmonary diseases that forced them to stop smoking for medical reasons. In other words, according to that study, the only thing that was more likely than hypnosis to get a person to stop smoking, was an extended stay in the intensive care unit! You might want to consider becoming a non-smoker before it gets to that point. 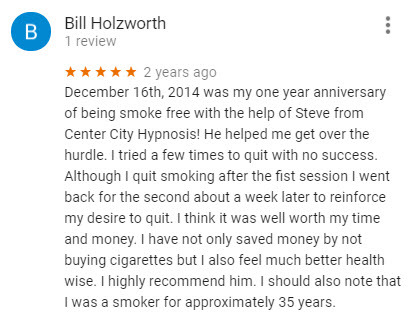 If you are hoping that a hypnotist will "make you" want to stop smoking, that is not a good sign. Any adult who expects someone else to make them take care of themselves has bigger problems than just a smoking habit. If you are no longer a 12-year-old and yet still believe that smoking makes you more mature, glamorous or tough-looking, I doubt that I can help you. 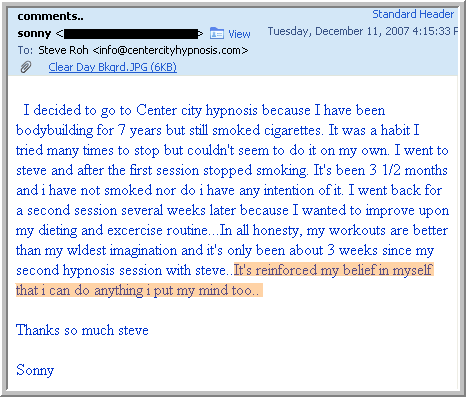 Finally, if you are hoping that hypnosis will make you think that cigarettes taste and smell awful --- you are in denial. You see, cigarettes actually do taste and smell dirty and trashy... but smokers have become desensitized to that. It's like those people who live in filthy houses with dozens of cats or dogs in the house, or who seem to be unaware of a personal hygiene issue; they've become so used to the smell that it's "normal" to them (or maybe they think just a little bit of Febreze makes it all better). Effective hypnosis is about helping people experience reality, not about adding an illusion on top of an existing delusion. "Numerous studies find that smokers earn anywhere from 4% to 11% less than nonsmokers. It's not just a loss of productivity to smoke breaks and poorer health that takes a financial toll, researchers theorize; smokers are perceived to be less attractive and successful as well." Also in that article: a 40-year-old who quits smoking and puts the savings into an average 401(k) would have nearly $250,000 by age 70. If you had the opportunity to make a small investment in yourself with a good likelihood of banking a quarter million later, would you do it? My clients are so cool; this client sent me the email above (used with permission), after calculating how much money she saved after our work. Aside from the money, can you imagine: if she hadn't quit smoking, she would have smoked over 10,000 cigarettes in that time! The thought of that makes even an ex-smoker like me feel a little nauseous. Maybe you're so financially well off that $2000-$3000 extra per year (or a quarter million over a lifetime) is no big deal to you. But what about Time? If you're that financially secure, you know that Time is even more valuable than money! Let's guess that each cigarette takes 5 minutes minimum. So a pack a day = at least an hour and a half every day. That's almost 50 hours per month! Now, are there any areas in your life that you keep telling yourself "I just can't find the time to get to that" or "I'm so busy, there aren't enough hours in the day!" And in the meantime, more than an entire work-week is going up in smoke every month, with NOTHING to show for it. If you can't stand the idea of cigarettes having that much control over your life, you already have one of the most effective mindsets necessary for quitting. Some people are concerned that they might be too control-oriented to get hypnotized. This is not a problem, IF the hypnotist is doing their job correctly. A hypnotist should be able to make use of that trait, in order to help achieve the client's objective. "My background is that I tend to think of myself as a control person, someone who likes to always be in control of their environment and the elements that they're with. 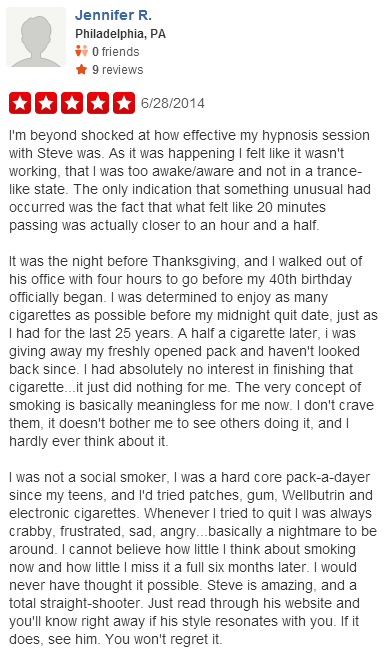 And I always was frustrated that what I couldn't control, specifically, was smoking. I couldn't somehow control that. I couldn't get beyond it. One of the things that I found very interesting was that what I have always led myself to believe and I've been, I guess, taught, is that this is a chemical dependency beyond habits, and boy, if you don't break it, it's not your fault, it's the chemicals. And I have to tell you that it's not the chemicals. They're easy to break, and it's really a matter of being in control and believing that you have the talents within yourself to do this. What I've found is that talents came in the door with me that were just unlocked by our work together. I've been smoking for about 40 years... I've tried the chemicals, I've tried patches, I've tried just about everything else, and I've always found a reason why that didn't work. But I guess the elements, the times, and everything else was right for using this to really let me get control back over the habit of smoking cigarettes. And it's been extraordinary for me." PS. If you're wondering what's up with all these disclaimers, they are just required to be in full compliance with Google policies regarding site quality. If adults want to smoke, I believe they should be given every opportunity to smoke their brains out, as long as it doesn't cause problems for anyone else, and as long as they're responsible enough to accept any resulting illness, disease and suffering without whining about it. I used to smoke too, so I know how it feels when well-meaning people try to convince smokers that they "should" stop by nagging them. Nagging is very ineffective (think about it: if nagging worked, it wouldn't be necessary!)... and in fact can make it harder for someone to change! For this reason, DO NOT setup an appointment for a loved one or friend, in the hopes that this will somehow "get them" to change. Do not fool yourself by thinking "my boyfriend / girlfriend / wife / husband etc. really wants to stop smoking, I'm looking into this for them." Face it: if they really wanted to stop smoking, they would be the ones looking into this, not having someone else do it for them. As a Darwinist (in the evil, non-scientific sense), I believe it is the natural order of things that people who choose to engage in harmful behavior will suffer, and they will make their families suffer. That's their choice. As a general rule, if a person does not care about their own health and survival, I don't care either. This is important to understand so that people do not mistakenly think that the hypnotist is supposed to "motivate" someone to change. I use the term Darwinist in the non-scientific sense here, because technically, unhealthy behavior such as smoking would only be an effective mechanism for natural selection if it killed people BEFORE they had a chance to reproduce and have children. From that perspective, the real problem with smoking is that it doesn't kill people fast enough, because the negative effects generally don't effect people until they've already had a chance to breed and/or transmit that weakness to family members and offspring. * It's not about pleading with you to care about your health, or "think about your children"
You already know smoking is bad, you've heard these things before, or at the least have thought them to yourself. You probably already feel like an idiot for smoking, so you don't need to hear that kind of message during hypnosis. Those kinds of messages, by themselves, aren't going to help most people (although a few people are responsive to that kind of "aversive" approach). Clients are often amazed to discover that, in many cases, they do not experience the commonly feared "withdrawals" or "cravings", or if they do, they find them to be surprisingly manageable. 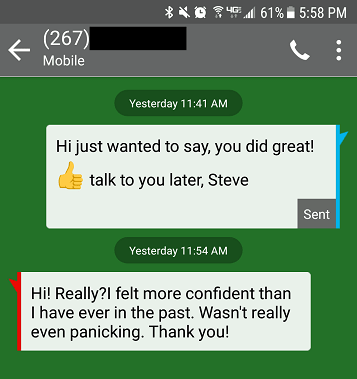 For example, in addition to the client in the audio clip above, another long-time smoker (38 years of smoking two packs a day) reported to me that he was stunned by the fact that there were no withdrawals or cravings after our first appointment. Through hypnosis, we help people experience the reality that withdrawals and cravings are just illusions in their mind. For people who are stuck in an illusion, it sounds hard to believe, but we use hypnosis to shift people's reality so that the illusion has no more power over them. It doesn't matter how long you've been smoking, or how much you smoke. What matters more is your current situation, and also your current level of emotional maturity (general ability and willingness to deal with life in a positive and productive way). Willpower does not matter that much either. Many people tell themselves "I just don't have enough willpower", but that is just a distraction and an excuse. Hypnotism makes willpower irrelevant. What Could You Have Instead? You may have thought about "giving up smoking"... but consider that if you spend your time and money smoking, you are already "giving up" and missing out on many other things that you'd much rather enjoy, and you probably don't even realize it. 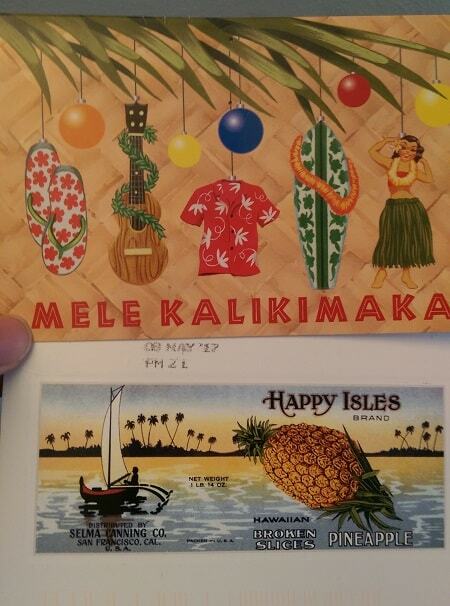 Pictured below are a couple of nice postcards I received from two separate clients who coincidentally both stopped smoking partly motivated by the desire to go on vacations to Hawaii as non-smokers. They both had previously travelled to that tropical paradise as smokers, but for their next trips, they wanted to enjoy the experience without having the unpleasant feeling of using those beautiful beaches as an ashtray. Think of how much money you spend every year on smoking. Then imagine the kinds of vacations YOU would be able to enjoy every year, once you stop wasting money on cigarettes! What kind of life would you rather have? Looking forward to your next trip to Hawaii... or another year of trips to the gas station or Wawa to buy a pack of smokes, settling for another "staycation" in order to support a cigarette habit. Even if you're loaded with cash, and money isn't a big deal to you, consider that even the wealthiest people are not immune from health issues: would you rather be sending family and friends postcards from your latest world travels, or getting "get well soon" and sympathy cards from people who heard about a cigarette-related illness you've been stricken with? Are you ready to take control and leave this useless habit behind? The figures she came up with were based on the cost of cigarettes in 2007/2008. Prices have changed since then! OK so we know cigarettes are expensive and only getting more so every year. So how much would hypnosis cost? Smoking can usually be handled in two office visits. Very few clients need to come in for the free follow-up. I say "usually" because in cases where people are having major difficulties in other areas of their life, often it's better to handle those things first, then it's easier to become a non-smoker once those issues are taken care of. That is something we can discuss during the free consultation. I'm confident about offering the FREE reinforcer because after working with thousands of stop-smoking clients, experience has shown that few of them need to use it... but if they do, I don't want them to hesitate to come back in for additional help. Yes, I accept credit cards. If you were to invest two or three hundred dollars with a good chance of making $3000 to $4000 in return (compounded annually! ), that's better than what's known as a 10-bagger among stock market players. 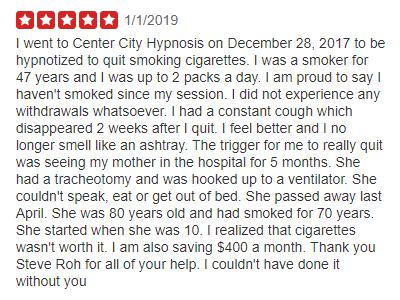 And although I cannot guarantee specific results, I can assure you that your chances of quitting smoking with hypnosis are much higher than getting lucky by betting a few hundred dollars on a stock, hoping for a 10x return. 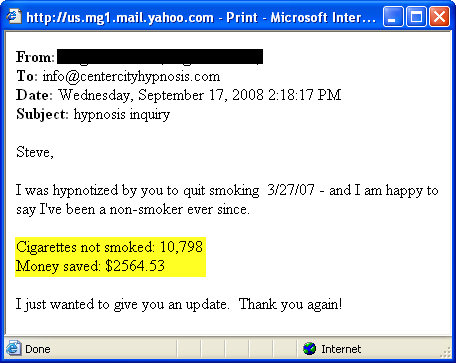 Still hesitant about using hypnosis to help you stop smoking? Thinking that "it's too expensive", while ignoring the money you already spend on cigarettes? While I know that hypnosis can be very effective for many people, I also understand that some visitors to this site could benefit from learning about other options. If you can afford to pay for cigarettes, yet believe that you can't afford this kind of help, you shouldn't be left without options; in fact you probably can least afford to deal with the consequences of smoking. So here is a link to the Southeastern Pennsylvania Tobacco Control Project (SEPA TCP), a regional coalition of nearly 60 organizations providing free tobacco control services in the area: http://www.sepatobaccofree.org/. I had the pleasure of meeting representatives of SEPA TCP at the recent launch of the Body Worlds "I Quit" program at the Franklin Institute. Check out their programs if you aren't moving forward with a hypnotic-based solution. The important thing is to DO SOMETHING, before it's too late. Even if you somehow escape the odds and suffer from no smoking-related diseases, do you really want to spend the rest of your life where the main thing you look forward to is your next cigarette? What will you do when you're older and more tired and run-down than ever? Do you think quitting smoking will be any easier then? Diets and Exercise Not Working? You've probably tried a lot of different diets. Maybe you've signed up for expensive gym memberships but just couldn't force yourself to work out enough to make a difference. The problem is that conscious willpower usually fades before good eating habits and regular exercise can become part of your normal routine. Hypnosis works by making positive changes directly to your subconscious mind, which is what controls your automatic habits. It also influences your emotions and beliefs about your self-image, which can be factors in how you treat yourself and your body in regards to food. Top fitness professionals identified six smart ways to spend your money: #1. Behavior changing programs. Programs designed to help you adopt a new exercise mindset, such as audio tapes, hypnotherapy or motivational classes can be a great way to break those ingrained sedentary habits. "These types of programs can help with [any] behavioral issues that prevent you from engaging in a healthy lifestyle," says Marta Montenegro, a professor of exercise physiology at Florida International University in Miami. Many use techniques such as visualization, positive suggestion, repetition and reinforcement to change patterns of thinking so you're more likely to hit the gym after work instead of the couch. Many people have picked up a habit of connecting emotions like boredom, insecurity or sadness with food, so that eating becomes more than just a way of satisfying true physical hunger. 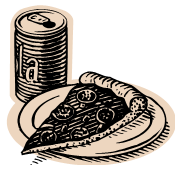 Hypnosis can help break those emotional connections between food and feelings. 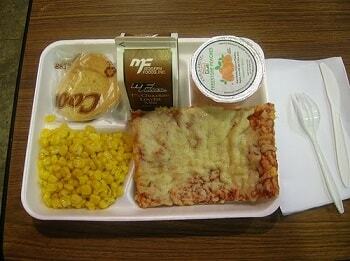 Yes, most of us were fed this kind of stuff growing up. We didn't have a choice back then. During hypnosis, we modify subconscious thought patterns to change how you relate to food and eating. Then you will be able to treat your body with respect, so that you don't overdo either dieting or consumption. Positive change will follow. Good eating habits will become a natural part of your personality. 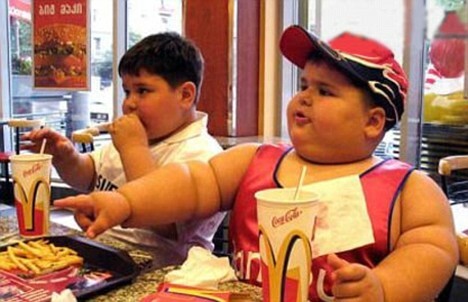 Unhealthy, sugary snacks and processed foods will become less appealing to you. You will spend less time thinking about the next opportunity to have a donut or piece of chocolate cake. Of course, results may vary, and you should not assume that another individual's experience will be the same as yours. This is just an example of what is possible. Many different factors play a role in determining outcomes, including current life circumstances, a person's daily environment, and the accumulated damage that's already been done to a person's metabolism and hormonal systems by unhealthy eating and sedentary living. Along that line, if you're trying to lose weight, it'd make sense to work with a medical doctor who specializes in the subject. Dr. Charlie Seltzer is a local MD who can help people get into shape, and he has deep expertise about the physiological side of things (I'm not a doctor, I'm a hypnotist, and unlike many "hypnotherapists" I don't pretend to be a doctor). 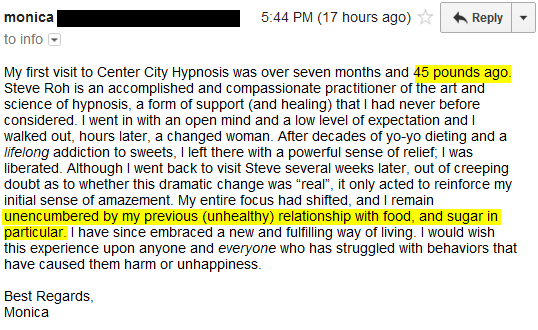 Working with an expert like Dr. Seltzer, who is also a certified exercise specialist in addition to being board-certified in obesity medicine, can be a great idea because it gets you all the benefits of medically-supervised nutrition, exercise, diagnostics and testing, and/or medication and supplementation, in addition to the behavioral "reprogramming" of hypnotism. So I recommend you check out his site: http://drseltzerweightloss.com/. Steve is wonderful, a kind and caring individual. I felt totally comfortable with him. I can not believe the difference hypnosis has made. 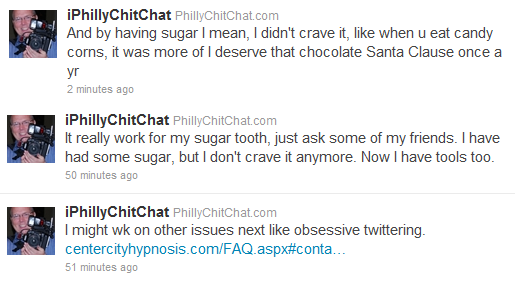 I asked to be "re-programmed" so I would not crave soda and sweets constantly, and that is exactly what I got. I have made a real positive change in my life with Steve's help, and would not hesitate to recommend him to others. HughE tweeted that about two months after our first meeting... making it through Halloween and Thanksgiving and many holiday parties noticing a real difference. Thanks for the plug HughE! It looks like a graphic from one of those movies about a mass epidemic or zombie apocalypse spreading across the country! And that clip only goes up to 2005... Can you imagine how things are now? So, this isn't just about wanting to be slim and liking how you look, although that's a great bonus. If your eating habits are wrecking your body to the point where you suffer a self-inflicted hormonal disorder that left untreated causes blindness, brain death and amputations, you might want to treat that as a matter of some urgency. Why wait til you cause yourself a preventable disease? Do something about it today. But this time, try something different, instead of going on another diet, or trying to use willpower and motivation. Willpower and motivation are temporary and unreliable. Any approach that depends on such conscious effort over the long-term is a weak strategy, and a diet mentality is very difficult to maintain over a lifetime. When a person changes their subconscious attitude about food, healthy eating stops being a big struggle or a chore. This isn't about depriving yourself so that you lose "X" number of pounds in record time, just to gain it back later. You've probably tried so many things to lose weight.. maybe it's time to try something completely different!